Remember the look of total amazement on the girls face when David Blaine performed his rising card effect, in his first ever TV special. That show shot him to fame and sealed the rising card as a MUST HAVE effect in all the best close up magicians repertoires. PROBLEM: You want to do the rising card ANYWHERE! You want to perform it fully surrounded, in REAL WORLD CONDITIONS! You need it to work perfectly TIME AND TIME AGAIN! Titanas (Creator of a list of hits like TITANS FINGER and FADE) has taken the rising card, spun it on its head and fired it out in a totally new direction! Those of you who are familiar with Titanas's creative stye, will know how he loves to take a classic magicians prop that most of us already own, and rework it in a whole new way. 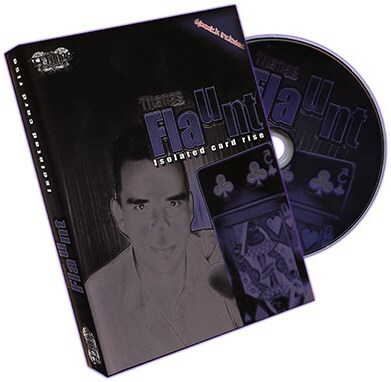 With Flaunt, Titanas, has taken a classic gimmick, thrown away all normal reasons magicians own and use it, and put it to work 'outside the box' The result is a technique that fools even magicians who own the 'old style' rising deck gimmicks. No matter if your new to magic or a working pro, take a few moments to check out the demo performance of Flaunt. You will be glad you did! Titanas sits down with you one2one, and takes you though the whole effect, he leaves nothing out, and you not only get this routine, but all the little tips and subtle points, that you only find out from doing a routine over and over again 'in the trenches'.